The February 12, 2017 emergency evacuation of nearly 200,000 California residents living in and around the town of Oroville, downstream from the Oroville Dam, was a stunning reminder of the ironic danger created by major dams. Built to prevent flooding and control the flow and use of fresh water, large dams also create the risk of a sudden, catastrophic flood against which nearby residents have no effective defense. The Oroville Dam was built in 1967 near the source of the Feather River, and it is the tallest dam in the United States at 770 feet. 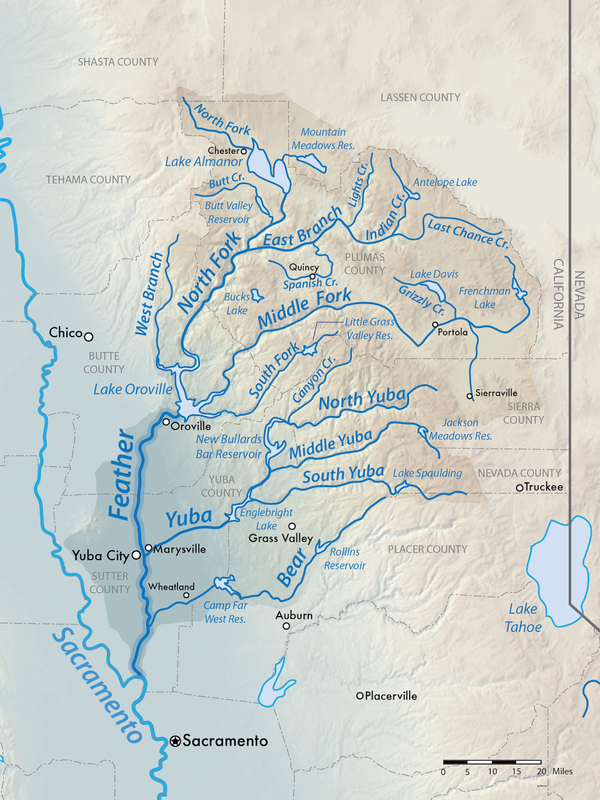 Four tributaries – the rather unimaginatively named West Branch, North Fork, Middle Fork and South Fork -- join up to form the Feather River. Prior to 1967, those four tributaries met in the area that is now covered by the Oroville Dam Reservoir. 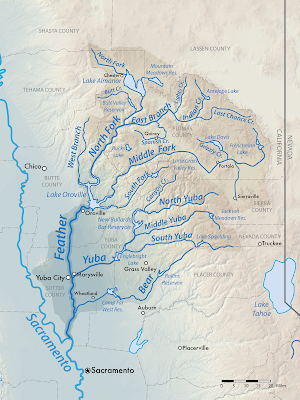 Now the tributaries feed into the Reservoir with the dam used to control the flow out of the reservoir and downstream to Oroville and Yuba City, with the Feather River ultimately flowing into the Sacramento River north of Sacramento. Along its path, the waters of the Feather River are diverted for use in hydroelectric plants, for agricultural irrigation and by citizens and other businesses. The Oroville Dam is of tremendous benefit to the citizens of California, but such a massive engineering project also poses a risk. If the Oroville Dam were to collapse, experts believe there would be no way to effectively warn nearby residents to evacuate before they are inundated with floodwaters. 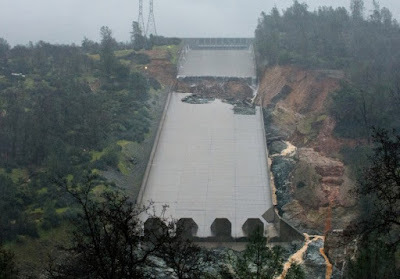 Far more likely than the collapse of a major dam itself, is the failure of the dam’s spillways, which is precisely what led to the Oroville crisis and evacuation. Recent heavy rains in Northern California swelled the tributaries feeding into the Reservoir, taking it record high levels. The Dam complex contains a main spillway situated near the Dam itself. The spillway is basically a long concrete chute that runs downhill and feeds water into the Feather River just below the point where the flow of water through the Dam emerges. The spillway – also built in 1967 -- is rarely in use, since its purpose is to release additional water when the Reservoir reaches dangerously high levels. When the spillway is opened, the speed and volume of water running down the concrete chute is tremendous, and in early February officials noticed that a huge section of the concrete chute had broken apart and been washed away into the Feather River. Concerned that the entire spillway would collapse, officials closed the main spillway, but the reduction in the flow of water out of the Reservoir led to the topping of the Reservoir, which sent water pouring over the Reservoir’s emergency spillway, located near the main spillway. The emergency spillway sends water down the raw hillside, and the force of that water severely eroded the hillside itself, creating the risk of a major collapse which could have flooded downstream communities. Officials were forced to reopen the damaged main spillway in order to reduce the Reservoir water level, and wisely took the precautionary step of issuing the evacuation order. The evacuation order was rescinded on February 14 and officials seem confident that enough water has now been released, and that they can repair the emergency spillway damage and eventually replace the main spillway – albeit at a cost of $100 million or more. So what caused the main spillway to fail? 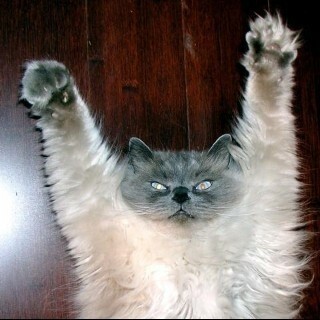 Theories abound. The soil beneath the massive concrete chute may have lost stability during the recent California drought. The roots of trees growing along both sides of the spillway may have weakened its stability. The spillway may have developed cracks over time due to suboptimal engineering and construction 50 years ago. Or the concrete may have been destroyed by a process known as cavitation. When water rushes across a concrete surface at high speeds and with tremendous turbulence, tiny air bubbles can deliver great force to the concrete surface and create cracks and fissures that expand and multiply, leading to a massive failure of the concrete deck and the complete erosion of the deck and underlying soil. Cavitation is believed to be the cause of spillway damage in Iran, Mexico, Turkey and several U.S. States over the last several decades. There are construction techniques – known as aeration – that prevent cavitation, but aeration was not utilized in the 1960s and the Oroville main spillway was not retrofitted with aeration features (a step that may have cost as little as 1% of the cost to replace the now destroyed spillway). The potential causes of the Oroville Dam problems are being analyzed now. We would do well to use the Oroville crisis as a wake-up call to inspect other major dams in the U.S. to determine whether they are also at risk of similar problems. The risk of failing to detect a similar failure and the potential for a major disaster are too great not to take careful and determined action now.